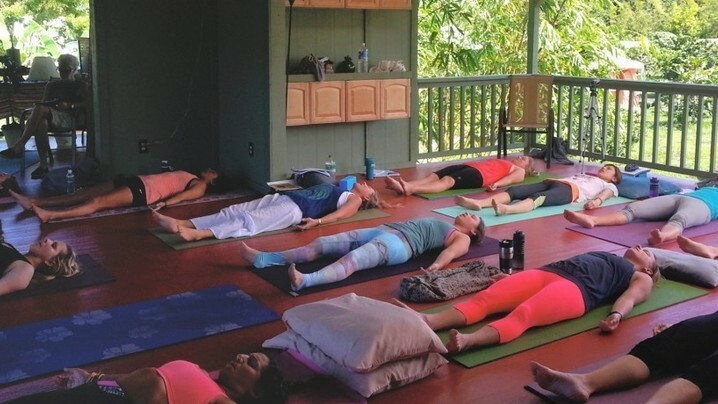 Experience a peaceful, sacred place for your meditation, yoga, and healing in Hawaii at this amazing vegetarian spiritual retreat center open to all paths & people. 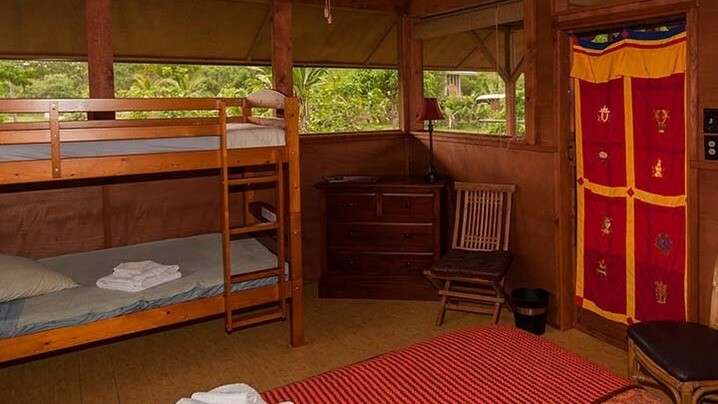 Kirpal Meditation and Ecological Center is a half mile from the ocean on the eastern tip of the Big Island of Hawaii, approximately seven miles from the small village of Pahoa. The 10-acre ocean-view property is blessed with average daytime temperatures of 85° F year-round, and 65° F at night, with cool, fragrant trade winds, surrounding tropical flora, including old growth mangoes, nearby swimming, surfing and snorkeling in the ocean and natural volcanically heated thermal oceanside pools. This property was once a papaya farm and is now newly planted with sour sop, jack fruit, pomegranate, rollinia, variety of bananas, figs, passion fruit, mamey sapote, avocados, papayas, sugar cane, coconut, lilikoi and guava. There are also loquat, cacao, macadamia nut, cashew nut, noni, starfruit, breadfruit, tangelos, grapefruit, oranges, tangerines, lemons, pomelos and more. The octagonal Balinese meditation pavilion is set among shade-trees with an expansive view of the ocean. The island wildlife is all around us – a variety of birds by day and at night there’s the pleasant chirping of Coqui frogs – and there are no snakes. Natural wonders include Volcanoes National Park, lava and crater viewing, volcanically heated warm ponds and steam vents (as outdoor saunas) and other wonders of the lush tropics. 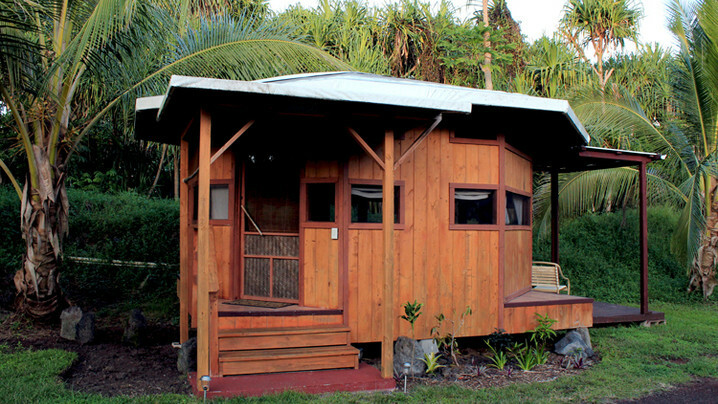 Not included: flights to/from 45 minutes drive from Hilo airport (ITO) and travel insurance. Guests are responsible for purchasing travel medical insurance and cancellation insurance which are also not included. My name is Kylie Larson and I love all things fitness! 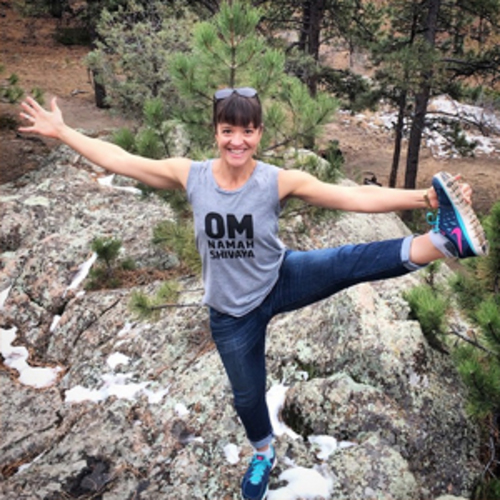 My teaching career began in 2009 after completing my 200 Hour Yoga Teacher Training with Green Mountain Yoga in Denver, Colorado. Since that time, I have added indoor cycling, HIIT, kettle bells, barre, yoga sculpt, TurboKick and bootcamps into the mix. 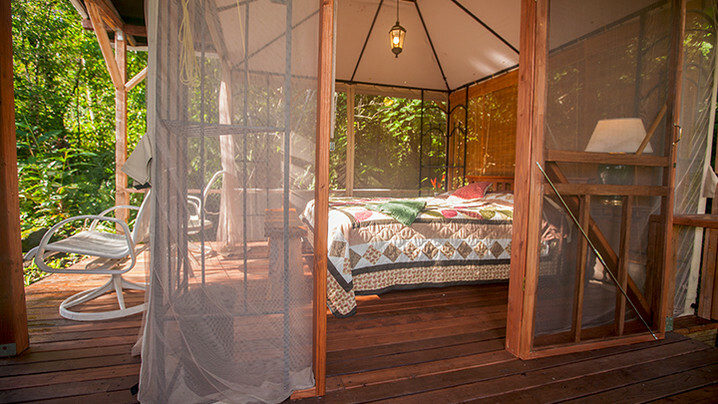 Kirpal Meditation and Ecological Center holds a 1000 foot Yoga Studio (Yoga Hale) with kitchen, private bath and an extra two bedrooms overlooking the ocean. 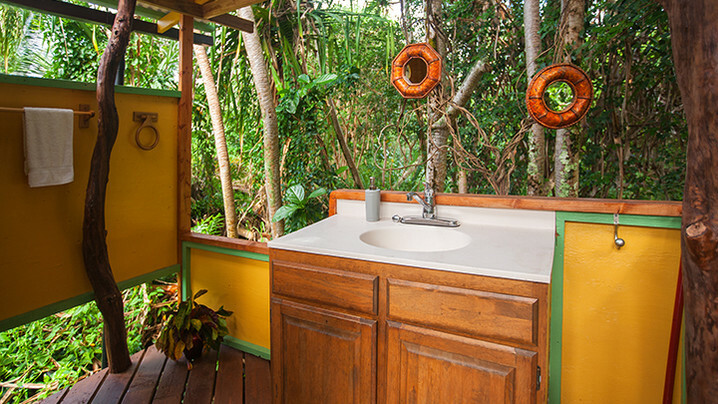 There are more than nice fully equipped (some with private toilet and shower) cabins tucked away here and there on our 10 acre property with over 102 different kinds of organic fruit and of our most popular get-away cabins are hidden in a jungle like setting. Close to safe swimming at Isaac Hale park and also we are within walking distance to our almost private thermal heated warm ponds and snorkeling. Volcano is near by for those interested in watching lava flow. Organic markets with local music and food stalls are close by and open at least twice a week. Our fully equipped community kitchen kitchen is open to all. We have safe drinking water, free internet reception and ATT telephone reception. We are open for all kinds of groups, weddings and programs and can accommodate vegetarian and non-vegetarian alike. We have a raw food gourmet chef on site. KMEC enjoys Hawaii’s ideal climate: light ocean breezes, sunny days, pleasant year-round temperatures (65-85°F) and occasional tropical showers. You may schedule your retreat any time of the year. This was an amazing trip. Everything was great. The volunteer's were very helpful, the food was amazing, the yoga was perfect for stressed muscles. They gave amazing facts about the land and area where we stayed. They provided recommendations on where to go for amazing sites and great memories. Such a great trip. You typically need a vacation from your vacation. Definitely not this one. So perfect! Trip was fantastic. Very relaxing. Trainer Angel awesome worked hard in boot camp followed up at night with yoga. Great company with all who was there with me. Kirpal center very rustic and outdoors just what was needed to relax and unwind nothing fancy. Great place, food, friends what else was needed. Would do it again. Join Kylie's Tribe and stay up to date on their trip!